Learn how to choose the perfect fence for your property. When it comes to your landscape, there are a variety of features that make the exterior of your home unique. One feature you should focus on when completing your landscape design is home fencing. Depending on the material, your home fencing can provide you and your family with well-needed privacy and security. 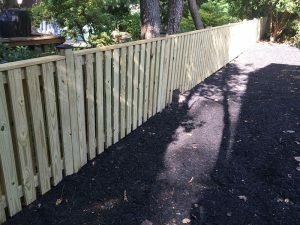 Right now is the perfect time to plan and choose new fencing because it will be ready for a spring or summer installation date. Luckily, there are a few simple tips to follow when choosing fencing for your property. Regarding home fencing, you need to know you want to install the structure around your home in the first place. Do you want to increase the amount of privacy on your property? Do you want a fence will increase security? Or do you just want to enhance the look and feel of your home? Once you answer these questions, you can determine the specific material for your fence. When choosing new fencing for your home, you should consider how often you want to care for the structure. If you do not mind providing your fence with regular maintenance, then wooden fencing is best for you. If you want the look of wooden fencing without the constant maintenance, then you should go with vinyl fencing. You do not have to paint or seal vinyl fencing, and it will last for many years to come. One of the most important aspects of the home fencing process is choosing the right company that meets all of your needs. You should take your time when choosing a fencing company because you want the process to go smoothly. Edward’s Lawn and Home have years of experience meeting and exceeding customer’s needs when it comes to home fencing. You want a company that is knowledgeable and well respected in the fencing industry. This entry was posted on Friday, January 12th, 2018 at 3:59 pm. Both comments and pings are currently closed.